These Terms and Conditions are part of the agreement between you and Globalplacement, concerning the usage of all products and services (the 'Services') of Globalplacement as described in these Conditions and the agreement and the usage of the website www.globalplacement.com. By registering and pressing the accept button, you acknowledge to have read and understood these Conditions. The General Conditions and therein stated terms are then accepted by you as part of the agreement between you and Globalplacement. When you don't agree with these Terms and Conditions you are not entitled to use the Website and the Services. These Terms and Conditions are available on the website of Globalplacement; on request they can be sent to you by Globalplacement free of charge. Globalplacement and its affiliated partners ('Globalplacement ') may revise these Terms and Conditions at any time by updating this posting. You should visit this page periodically to review the Terms and Conditions because they are binding on you. 1.1 Placement - represents a work experience within the organisation of the employer, presented on the Internet site of www.Globalplacement.com , not to be qualified as a (first) job after graduation or as a part-time job during study. 1.2 Company profile - a brief description of the profile (type of company, scope, activities, etc) of a certain employer. Filled in and posted on the Website by means of an electronic profile form. 1.3 Contactdata - name, address data and other contact data (such as phone number and e-mail address) of both candidates and employers. 1.4 CV - The curriculum vitae of a student that has been filled in and posted on the Website by means of an electronic CV form and/or possibly as attachment to the profile. 1.5 Electronic date exchange - Sending or receiving information and/or declarations by means of electronic communication such as e-mail, EDI (Electronic data Interchange) or interactive Internet pages. 1.6 Match - Formation of an agreement, on the basis of a student profile and/or CV and a placement or vacancy (possibly with a company profile) of an employer, between the concerning student and the concerning employer with respect to fulfilling the placement or vacancy by the concerning student. The way the agreement has been formed (orally, in writing or by means of electronically exchange) is therefore irrelevant. 1.7 Order - The order of an employer to Globalplacement to find a suitable candidate for a vacancy. 1.8 Student - Every natural person registered as a student on an international recognised institute who has submitted an application to the Website. 1.9 Student profile - A short description of the profile (name, address, education, experience, etc) of a certain student, that has been filled in and has been placed on the site by means of the electronic profile form on the Website. 1.10 Website - The Internet site www.Globalplacement.com and/or partner sites. 1.11Employer - Person or organisation that needs to find a student for a placement or work experience within its own organisation or in case of intermediary, within the organisation of its constituent. Consults the CV/student profile database and/or places a company profile as well as an accompanying placement on the Website; or the person or organisation which has a vacancy open within its own organisation, or, in case of an intermediary, within the organisation of its constituent, for whom Globalplacement has been ordered by the employer to find a suitable candidate. 2.1 The general conditions apply to all offers, activities, tenders and agreements for recruiting and consultation between Globalplacement and (potential) employers, respectively their legal successors. The relevance of possible general conditions of the counterpart of Globalplacement are hereby explicitly excluded. 2.2 An agreement with Globalplacement is formed by an affirmative response (by means of the Website or by means of e-mail) from Globalplacement after receiving the application of the employer for using the service(s) and the Website. If after the formation of the agreement it would appear that the person in service of the employer was not competent to form the agreement, the liability that follows from this will remain on the employer and the agreement remains thereby in effect. 3.1 The employer is responsible for placing its company profile and potential placements (on www.Globalplacement.com ) on the respective website by filling in and send the indicated electronic forms on the Website. Sending can occur by means of electronic date exchange or, if an agreement exists to this end, by means of telephone/fax instructions to Globalplacement. 3.2 The employer is entirely responsible for correctness and completeness of its profile, as well as keeping his own profile up-to-date in our Company profile database. correctness, completeness & relevance: The data are correct, fully completed and to the point concerning the placement. instructively: The offered placement is instructive for the student in the sense that he/she can gain useful experiences, appropriate for a possible first job and for their educational level. pleasant: The offered placement takes place in pleasant surroundings where the student can acquire or confirm contacts. 3.4. For an employer it's possible to have a maximum of 10 placements on the site. In order to place more placements authorisation needs to be granted by Globalplacement in writing or electronically. 4.1 The student is responsible for placing its student profile and CV on the site. The student remains responsible for correct and complete representation of the data. The data given by students will not be adapted by Globalplacement. 5.1 The employer can view the data (e.g. company profile, training periods, graduation assignments, current applications and received responses of students) of the assignments on-line and keep it updated. Therefore the employer chooses a personal password during registration. The subscribed e-mail address of the employer is will be the username. 5.2 The use of the user name in combination with password (the ' access data ') gives the employer entrance to the data on the website and permits the sending of applications in name of employer by means of the site. 5.3 The employer is responsible for the preservation and confidentiality of the password. In other words, the employer is obliged to make sure that this data does not fall into the hands of unauthorized persons or organisations. Globalplacement bears no responsibility for the loss of access data. If the data does fall into hands of unauthorized persons or organisations, it is the employer who has to inform Globalplacement as soon as possible. 5.4 If Globalplacement has reasonable grounds to assume, or discovers, that unauthorized third parties are using (or possibly using) the services and/or access the site by means of the access data of a certain employer, Globalplacement then has persmission to undertake action and block the access data, without preceding report. Afterwards, a new password will be supplied at the request of the concerning employer, unless Globalplacement has reason to believe that the unauthorized use is to blame to a behaviour or shortcoming of the concerning employer. 6.1.1 Via the website, students can apply for placements and/or graduation assignments of companies and their company-profiles. The searchable information is anonymously available for students, meaning that the contact information of the company will not be available when searching. 6.1.2 When a student applies for a placement/graduation assignment, Globalplacement receives a confirming message. Globalplacement will automatically inform the employer about the profile of the student (without contact information) by email. The employer should react on the application within 5 working days by informing Globalplacement whether he is interested in the application of the student or not. If the employer shows interest in the applicant (by accepting the application) Globalplacement will automatically send the contact information of the student to the employer. The employer should contact the applicant within 5 days after the contact information has been provided. 6.2.1 An employer also has the option to invite students for a placement or graduation assignment by searching through Globalplacement’s database himself. The employer can select specific students, watch their CV and profile, and personally invite them. The student profiles are available anonymously, meaning that the contact information of the students is not available. In order to accept a student and to receive his contact information, the employer needs to have paid registered account at Globalplacement. 6.2.2 When an employer accepts a student, Globalplacement will automatically send this student an email message. This email includes the company profile, the placement description and a link to the employer profile. Globalplacement sends the contact information of the student to the employer when the employer has paid his registration fee. Again, the employer is obliged to contact the student within 5 days after the contact information has been provided. 6.2.3 If the employer does not react to the application(s) within 90 days, Globalplacement has the right to change the status of the vacancy to "unavailable", or withdraw it from the website. 6.3.1. The employer will have to pay the agreed fee after accept or invite one student (received contact information). The fee will have to be paid only once, regardless the amount of reactions and regardless the students actually being employed. The vacancy will be available for 3 months and the deadline of the vacancy is 3 months after the vacancy's registration. 6.3.2 If there is no acceptation, the vacancy will still have a deadline of 3 months and there will be no costs attached. If the employer accepts a student after the placement vacancy has been put offline, the agreed fee will still be charged. 6.4.1 Globalplacement and the employer can agree that Globalplacement actively searches for students who can fulfil one or several placements/graduation assignments on behalf of the employer. The way Globalplacement searches students is both by phone and electronically. 6.4.2 If Globalplacement selects or suggests several students to the employer, the employer is obliged to react to all of them (by accepting or refusing) as described in article 6.1. 6.4.3 Just as for the normal procedure for recruiting students for placements/graduation assignments through the website, Globalplacement is not responsible for the quality or reliability of the registered students during the searching process. The other disclaimers and liability decisions in these conditions and the other terms and conditions are equally applicable for this active search service. 7.1 When using the anonymized student profiles and CV-databases of Globalplacement or the provided contact information, the employer is obliged to restrict the use of this information to the purpose of fulfilling the specific or relevant placements/graduation assignments, unless the student has clearly given the employer permission to use it for a different purpose. 7.2 The used and provided data of the students is confidential and remains property of Globalplacement. The employer is not allowed to make this information available to third parties in any way whatsoever, unless this is necessary for the above mentioned purpose. 7.3.It is not permitted for employers and organisations to use the profiles, contact information, or search tools for other vacancies in the company that are not registered at Globalplacement. 8.1 If the student or employer does not meet one or several agreements after there has been a match, the party concerned should inform the other party about it as soon as possible. Globalplacement carries no responsibility or liability whatsoever. 8.2 If the employer decides to cancel the placement/graduation assignment after making agreements with the student, or if he decides to give the placement/assignment to another candidate, he should independently inform the student as quickly as possible. The employer should also inform Globalplacement about the situation and give an explanation as quickly as possible. However, this cancellation will not result in any responsibility or liability whatsoever for Globalplacement. 9.1 When the established agreement between the employer and the student, regarding the internship/graduation assignment, ends the employer is free to make new arrangements with the student without having to use the website of Globalplacement and without having to pay Globalplacement. 9.2 An exception to this rule exists when the employer places a new vacancy on the website and invites a student on the basis of his or her profile. In this case the same procedure as mentioned before will be applicable. This situation is also applicable if the employed student happens to be a former intern or employee of the company. 10.1 The data inserted by the employer can be changed and updated on the personal page which can be opened by the employer with his/her own username and password. 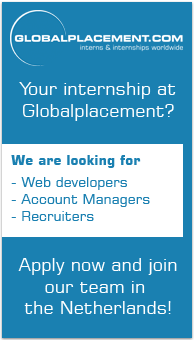 10.2 Globalplacement will use the inserted data for the use for offering services through the website or otherwise. The data on the website will be anonymous, meaning that the contact information in the student profiles and CV-databases will not be visible. If the employer has published personal data, this will be handled according to our privacy statement, which is available on our website. The privacy statement is part of the Terms & conditions. 11.1 Globalplacement offers several possibilities of advertising via the website, including company presentations and banners. The form, time, and placing conditions of individual advertisements are discussable. The tariffs of Globalplacement are available on the website and need to be agreed on by both parties before signing an agreement. 11.2 Globalplacement has the right to cancel or refuse a banner, presentation or other advertisements at any time with any argument. 11.3 Globalplacement also has the right to cancel or refuse the content of a banner, presentation or other advertisements if the content is considered illegal, unethical or shocking. 11.4 Globalplacement also has the right to directly cancel the contract with the advertiser without involvement of jurisdiction. This right overrules the other rights of Globalplacement. 12.6 The employer may not hack the website or gain access (or manipulate) databases in an unauthorized way. 12.7 If the employer does not keep himself to one of the above mentioned points, Globalplacement has the right to directly cancel the contract with the employer and deny access to all information without interference of any legal jurisdiction. This right overrules any other right mentioned in these terms & conditions. 13.1 Both parties agree that electronically established agreements and electronically sent data are legally binding in case of a legal procedure. 13.2 Both parties agree that in case of a conflict about the content, form, or sent/received time of an electronically sent message by the other party, the inserted information on the website, or a received message from Globalplacement's website, the information in the database of Globalplacement is legally binding. 14.1 If the other party does not keep itself to one or more of the agreements stated in the agreement, the other party is obliged to pay for all the resulting indirect and direct damage (including additional costs and actual legal costs). 14.2 This issue does not interfere with the right of Globalplacement to start any other claims against the other party, including claiming the right to take other legal measures, such as dissolving the contract without legal interference. 14.3 Globalplacement is not liable for any damage done to the employer as a result of the made match with a student/candidate or if the student/candidate does not keep himself to the contract made with the employer. 14.4 Globalplacement is not responsible or liable for any of the content, correctness, rightfulness or completeness of the company profiles, internship/graduation assignment descriptions, student profiles, CV's Banners, links or any other information placed online by employers or students/candidates, concerning identity, quality and reliability. 14.5 Globalplacement is not liable for the damage done to the employer or third party as a result of a student who does not have the required diploma or other proof of competence. 14.6 Globalplacement is not liable if someone abuses the personal password that the employer needs to keep his data up-to-date and to get access to the site and its services. The employer should assure that third parties do not use or abuse his username and password illegally. 14.7 Globalplacement is not liable for the number of applications and the accompanying actions. 14.8 Globalplacement is not liable for any damage or loss as a result of an incorrect selection of a student/candidate by the employer, or otherwise as a result of an incorrect selection of an internship/graduation assignment by the student. 14.9 Globalplacement is not liable or responsible for arranging a replacing student/candidate for the employer or third party if a selected student/candidate does not fulfil his tasks sufficiently or if the student does not keep himself to the contract. 14.10 Globalplacement has the right to cancel, refuse, or de-activate the company profile and/or placement/graduation assignment description, or decide to deny access on the basis of the conditions mentioned in "unauthorised usage". 14.11 If a student/candidate has received a reward or payment from the employer, that is lower than the wage to which he/she is entitled according to collective working conditions or other contracts, the employer is liable and will cover all damages and costs of Globalplacement. 14.12 The employer is liable for all damage and costs, including fiscal costs and costs that Globalplacement has suffered as a result of incorrect, insufficient and illegal actions of the employer with regard to the agreement (legally and otherwise). 14.13 Globalplacement cannot guarantee the correctness or legality of the data on the website. Therefore Globalplacement is not liable as far as this is in conformity with the (privacy) law. The other party cannot claim any costs or damage to Globalplacement (including claims from third parties) regarding the unlawful use of (personal) data of other parties or third parties. 14.14 Globalplacement is not liable for any damage as result of the unavailability or disturbance of the website or the facilities of an internet provider and/or telecommunication provider. 14.15 Globalplacement is not liable for the refusal of a banner, company presentation or other form of advertisement via Globalplacement, neither for the cancellation of advertisements and other forms of advertising via the website or services. In addition, the other party cannot claim damage or costs, including claims from third parties, based on the fact that the placed advertisements and other forms of advertising can be considered unlawful, unethical or shocking. 14.16 Globalplacement is not liable for the damage done to the other party or third party as a result of inviting or employing a candidate that does not meet the required conditions, unless this was intentional or unless a mistake has been made on Globalplacement’s side. 14.17 If our liability is confirmed in a legal procedure, Globalplacement’s maximal liability is limited at €250 per case. If the damage concerns the selection of a student/candidate by Globalplacement for the employer, the maximal liability is limited to 30% of the tariff for that specific service. 14.18 If the employer/third party wants to claim damages, the employer should send a motive letter to Globalplacement within 3 months after the damage arose or within 3 months after the damage has been noticed, which proofs that the complaint is timely and legal. 15.1 The price for creating a company profile or posting vacancies for placements/graduation assignments is mentioned on the website. 15.2 The prices of other services as described in these conditions are also mentioned on the website or are specifically and clearly discussed and agreed on with Globalplacement. 16.1 The employer is always obliged to fulfil the invoices sent by Globalplacement within 14 calendar days after the invoice date (unless a written agreement clearly states otherwise). 16.2 The mentioned or agreed on tariffs are specified in Euro's, and exclude VAT and other possible taxes/tariffs (unless a written agreement clearly states otherwise). 16.4 Only payments to Globalplacement itself are valid. Payments made to students or others or upfront payments to students or others can never be an argument for a debt- postponement or discount, unless a written agreement with Globalplacement clearly states otherwise. 16.5 If the invoice of Globalplacement is not paid within 14 calendar days after the invoice date, the employer owes Globalplacement a monthly interest on the opened debt. A part of a month is considered a full month. 16.6 The copy of Globalplacement s invoice that is sent to the employer (possibly including an electronic copy) is a fully valid proof of the interest debt and the day on which this calculation starts. 16.7 Unless agreed on differently, reclaims on invoices should be sent to Globalplacement by post within 30 days after the invoice date. In this letter the employer should prove the argument of this reclaim. After the period of 30 days, complaints are not taken into consideration anymore and the employer uses the right to reclaim the invoice. A reclaim does not give the employer the right to cancel or postpone the payment of the invoice. 16.8 All costs made by Globalplacement in case of an unpaid invoice (including the costs of legal institutions or debt collecting agencies) are fully accounted to the employer. These costs can be accounted to the employer without any further proof. 17.1 All Author rights, brand rights, business rights, database rights and all other intellectual property rights based on software, the website, the services or Globalplacement , the information on the website (Excluding possible author rights on the content of the company profile, vacancies, logo's, brands and other information on the website, for which the employer gives Globalplacement non-exclusive user rights) are only given by Globalplacement and/or its licence. 18.1 If at least one of the issues in these terms & conditions turns out to be invalid or inapplicable, the other issues will keep their validity. The issues that are not valid or applicable will be replaced by issues that are similar and valid in order to make them applicable. 19.1 Contracts with Globalplacement are valid for an undetermined period, unless the contract specifically states differently. Cancellation is possible at any time, both for the employer and Globalplacement, with a cancellation period of 4 weeks. Open and invoiced debts to Globalplacement remain valid and can be demanded directly. When ending the contract, all access to the website will be denied. 19.2 Globalplacement has the right to change these terms & conditions at any time. Changes will be notified through the website or via email, at least 30 days before the actual change. If the employer does not agree with the change, the employer has the right to inform Globalplacement (by email or post) within 30 days after the announcement. Possible open and invoiced debts remain valid and can be demanded directly. 20.1 Contracts with Globalplacement are managed and controlled by Dutch law. 20.2 If a conflict appears with the contract with Globalplacement regarding the use and services of the website, the parties will try to solve the problem personally before contacting a third party. If the parties do not solve the problem personally, the conflict will be forwarded to a court in the region of Amsterdam. This procedure does not interfere with the right of both parties to start a short lawsuit in case of an emergency. 20.3 The concerned party declares to have read and understood these terms & conditions and agrees with the conditions and the privacy statement. 20.4 The Terms & conditions are published and available for uploading on the website of Globalplacement. You can also request them by post free of charge.